Are you buying ready made curtains for your home? Ready-made curtains are a great option, providing you a quality product that will greatly benefit any room interior. But what colour should you choose? This is an important question, and it’s perhaps worth looking at the favourite colours for ready made curtains to see if any of these take your fancy. If you’re decorating your bedroom or work space in your home, blue might be the perfect colour choice. Blue colours have been shown to be great for both insomnia and levels of concentration. So whether you want to remain efficient or just get a full night of sleep, this could be a fantastic solution. Blue curtains come in a variety of different shades and styles from midnight blue to the colour of a crystal clear sky. Green curtains are ideal if you want to be reminded of the connection we all have to nature. That’s why they are a popular choice for the conservatory, sun lounge or kitchen. However, they are also great for relaxing which is why some people do choose to hang them up in the bedroom. Be aware that while green can be a great choice, some people will find the colour quite distracting, particularly if it is an intense shade. As such, it might be best to clash the green curtains with the rest of the room, rather than set up the whole room with this colour. Whether you opt for a dark, moody red or a royal variety, this is always a fantastic option and provides some energy and flair to a room. They are commonly seen in living areas and dining rooms. Interestingly some experts believe that the colour red causes people to convey more emotion than they normally would. Whether or not this is true, it has long been a recommended option when selecting modern and stylish curtains for your home. You can choose a butter yellow or something a little more subtle. In either case, you are sure to love the impact it has on your room. 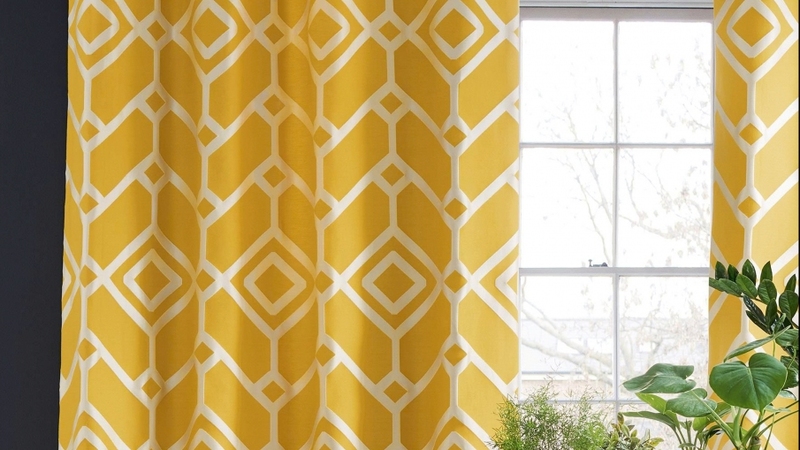 Yellow curtains immediately brighten up the place and make sure that it looks absolutely fantastic. Since this is a brighter, friendlier choice, you will usually find this is the colour chosen for ready made curtains in the kitchen. Dark brown or ash shades are the perfect way to provide a cosy, comfortable atmosphere. That’s why they are often considered for living areas and front rooms. If you do choose this colour, make sure that the rest of the room is a little lighter otherwise it can seem a tad dull. You need to be careful about which shade you pick too. Luckily, Montgomery Interiors and similar design experts can provide the perfect shade of brown for your home and make brilliant recommendations. As such, you don’t need to worry about this design choice going wrong at all. We hope this helps you find the perfect colour for the curtains in your home.